Please refer to our stock # H6281 when inquiring. 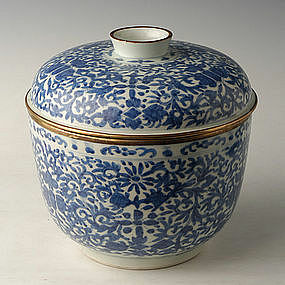 Specially made for the Thai market, decorated with stylized floral design on leafy scrolls background, with metal bands on the rims of the bowl and cover. Measurement: Diameter 25.7 C.M. / Height 25 C.M. Condition: Very good condition, with no crack or repair. Please see enlargement photographs for details.